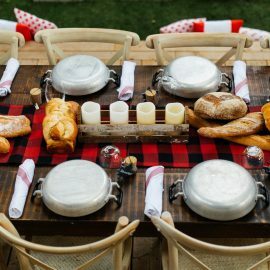 When given the challenge to come up with “something different” to present for a workshop at Fort York National Historic Site for the event Mad for Marmalade, Crazy for Citrus presented by Culinary Historians of Canada, I created this savoury rendition of a winter preserving tradition. This year, 2017, marked the 10th annual Mad for Marmalade but, unfortunately, it was the swan song of this citrus-filled event. It was an honour to be part of the day and to be immersed in aromatic citrus fruits and among so many passionate preservers. 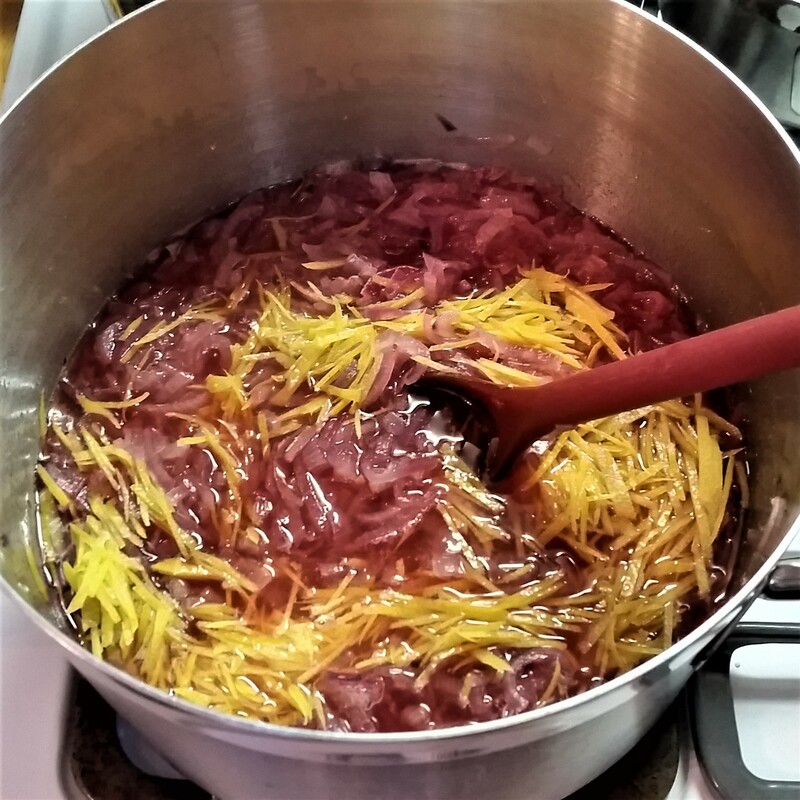 Traditional sweet marmalade is always on my preserving menu to stock up each winter, whether it’s classic Seville, a Grapefruit Pomegranate, or something creative using a mix of frozen and fresh fruit such at Tart Cherry Seville. When tasked with creating something different for Mad for Marmalade (M4M for short) I turned a sweet and tangy Red Onion and Raisin Chutney recipe from my book, The Complete Book of Pickling, into a savoury marmalade – okay, it’s still somewhat chutney-like but it does have lemon peel and tastes like marmalade. With the zest of citrus you love in a sweet marmalade and a depth of savoury flavour from slow-cooked onions, you’ll be inspired to add this decidedly different marmalade to cheese platters, on top of fish, poultry and burgers, and maybe even spread on toast! I’ve taken to adding a spoonful for a flavour boost to my stand-by lunch of chickpea, cheese and veggie salad. 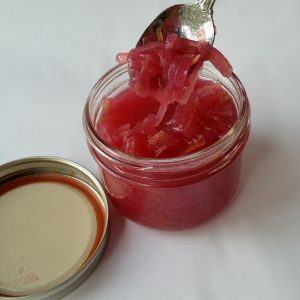 This marmalade has a lower sugar content than a sweet marmalade and I decided not to set it with pectin to make sure it wasn’t too weird to use in savoury dishes. A glob of jellied onion on smoked trout just seemed too ’60s to me. Simmer the onions, sugar and water first to make sure the onions get nice and soft, but don’t lose their shape. They do lose their colour at first, but don’t worry…. there is some magic…well, actually food science, which happens later. While the onions simmer, peel the zest from the lemons. 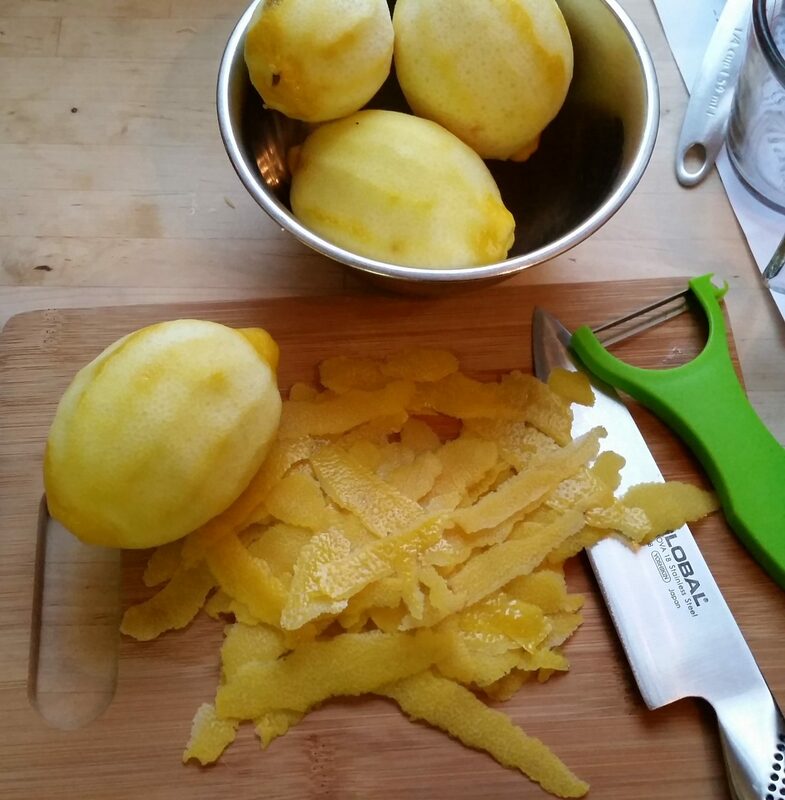 A y-shaped peeler is best for this to get wide strips; try not to get the white pith when you take the yellow zest. If a little bit of pith is on the back of the strips, just use the back (dull edge) of a paring knife blade to scrape it off. Too much pith will make for a too-bitter marmalade. This is definitely the time to sharpen your knife before you start, and be patient. Think of it as a good chance to practice your knife skills. 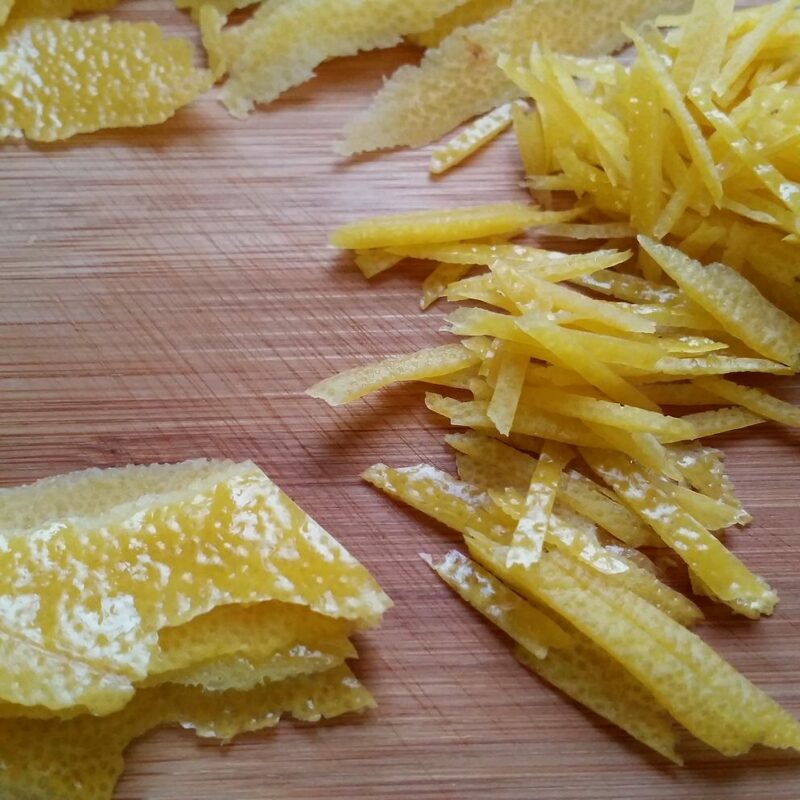 The fine shreds will make a nicer looking marmalade, and better mouth-feel in the end. Stack the strips of zest a few at a time and slice away…. Simmer, and stir gently, until the bubbles in the syrup slow down and get quieter (you might have to turn the cooking tunes down to hear this) and the lemon zest is translucent but not falling apart. The liquid will be somewhat syrupy but the usual marmalade doneness tests (sheeting, wrinkling, etc.) won’t work so don’t bother with those. You want the texture to be a little thinner than your desired end texture since it will thicken and set up a little after it cools and sets. Fill your hot jars, wipe the rims, seal with the two-piece lids (using new discs!) and pop them in the boiling water canner (that you have all ready because you did that before you started your marmalade, didn’t you?) to process for 10 minutes. After the jars cool, let the marmalade rest in a cool, dark place for at least a week for the best texture and flavour. 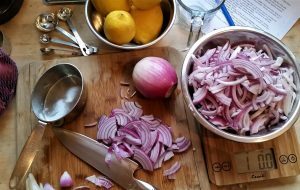 Check out those gorgeous, translucent strips of onion and lemon zest and you’ll be glad you took your time to slice it all up. And your friends and family will be, too. Cut onions into quarters lengthwise, or into sixths if large. Cut crosswise into thin slices. 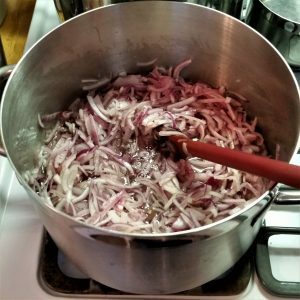 The sliced onions should weigh about 3 lbs (1.5 kg) or measure 12 cups (3 L) volume. In a large pot, combine onions, sugar, salt, hot pepper flakes and water. Bring to a simmer over medium heat, stirring often. Reduce heat and boil gently, stirring occasionally, for about 15 minutes or until onions are very soft. Meanwhile, using a vegetable peeler, peel wide strips of zest from lemons, avoiding the white pith. Scrape any white pith from zest with the edge of a knife, if necessary. Cut zest crosswise into thin shreds. Measure 2/3 cup (150 mL) lightly packed and set aside. Cut lemons in half and squeeze out enough juice to make 3/4 cup (175 mL); reserve any extra for another use. Discard lemon shells. Stir lemon zest, lemon juice and vinegar into onions. Return to a gentle boil, stirring occasionally. Reduce heat and simmer, stirring often, for about 20 minutes or until onions and lemon zest are translucent, and liquid is syrupy. Ladle hot marmalade into hot jars, leaving 1/4 inch (0.5 cm) headspace. Remove air bubbles and adjust headspace as necessary by adding hot marmalade. Wipe rims and place hot lid discs on jars. Screw bands down until fingertip-tight. 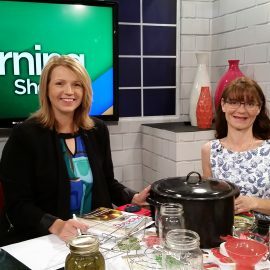 Place jars in canner and return to a boil. Process for 10 minutes. Turn off heat and remove canner lid. Let jars stand in water for 5 minutes. Transfer jars to a towel-lined surface and let stand for 24 hours. Check lids and refrigerate any jars that aren’t sealed. Copyright Jennifer MacKenzie, P.H.Ec. 2017Makes about seven to eight 8-oz (250 mL) jars or thirteen 4-oz (125 mL) jars.